Early Christianity grew gradually in Rome and the Roman Empire from the 1st to 4th centuries. In 313 it was legally tolerated and in 380 it became the state church of the Roman Empire with the Edict of Thessalonica. Nevertheless, Hellenistic polytheistic traditions survived in pockets of Greece throughout Late Antiquity until they gradually diminished after the triumph of Christianity. The Romans tended towards syncretism, seeing the same gods under different names in different places of the Empire, accommodating other Europeans such as the Hellenes, Germans, and Celts, and Semitic and other groups in the Middle East. Under Roman authority, the various national myths most similar to Rome were adopted by analogue into the overall Roman mythos, further cementing Imperial control. Consequently, the Romans were generally tolerant and accommodating towards new deities and the religious experiences of other peoples who formed part of their wider Empire. The more philosophical outlook of the Hellenic parts of the Roman empire led to a renaissance of intellectual religious thought around the start of the 2nd century. Writings pseudepigraphically attributed to Hermes Trismegistus, and discussing esoteric philosophy, magic, and alchemy, began to spread from Roman Egypt throughout the empire; while they are difficult to date with precision, these texts are likely to have been redacted between the first and third centuries. Although such hermetica was generally written with the theological aim of spiritual improvement, each text had an anonymous, eclectic, and spontaneous origin, rather than being part of an organised movement. A more organised form of alatrist henotheistic panentheism emerged in parallel to Hermetism. In the 1st century BC Cicero's friend Nigidius Figulus made an attempt to revive Pythagorean doctrines, an effort that was particularly successful under Apollonius of Tyana in the 1st century; within a century, supernatural powers were being ascribed to Apollonius, and accounts of his life had similarities to those of Jesus. At least one major meeting place for followers of this neopythagoreanism was built in Rome itself, near Porta Maggiore, to a design similar to later Christian churches, though subterranean. In the 2nd century, Numenius of Apamea sought to fuse additional elements of Platonism into Neopythagoreanism, a direction which Plotinus continued, forming neoplatonism, a religion of theistic monism. Neoplatonism began to be adopted by prominent scholars such as the Christian theologian Origen and the anti-Christian Porphyry. During the rule of Gallienus, the imperial family themselves gave patronage to Plotinus, and encouraged his philosophical activities. Neoplatonism was further developed by Iamblichus, who believed that physical invocations would be able to produce soteriological results, and therefore added religious ritual to the philosophy. Emperor Julian tried to unify traditional Roman religion by mixing it with Iamblichus' form of neoplatonism; the influential Christian thinker Augustine of Hippo lived during this period, and his subsequent writings show heavy neoplatonic influence. At some time around the first century, the members of the Roman military began to adopt the mystery cult of Mithraism; this sun-god related cult arose from obscure non-Roman origins, and the first surviving reference dates to Plutarch's mention of a 67 BC observation of certain Mediterranean pirates practising it. As the Roman legions gradually moved around, so too Mithraism spread throughout the Roman Empire; in the beginning it was mainly soldiers who followed its precepts, but it was also adopted by freedmen, slaves, and merchants, in the locations where the legions rested, particularly in frontier areas. Mithraism wasn't exclusive - it was possible and common to follow Mithraism and other cults simultaneously. It eventually became popular within Rome itself, gradually gaining members among the more aristocratic classes, and eventually counting some of the Roman senators as adherents; according to the Augustan History, even the emperor Commodus was a member. Although, for reasons currently unknown, Mithraism completely excluded women, by the third century it had gained a wide following; there are over 100 surviving remains of temples to Mithras, 8 in Rome itself, and 18 in Ostia (Rome's main port), with Rome having over 300 associated Mithraic monuments. From the reign of Septimius Severus, other, less gender-specific, forms of sun-worship also increased in popularity throughout the Roman Empire. Elagabalus used his authority to install El-Gabal as the chief deity of the Roman pantheon, merging the god with the Roman sun gods to form Deus Sol Invictus, meaning God - the Undefeated Sun, and making him superior to Jupiter, and assigning either Astarte, Minerva, Urania, or some combination of the three, as El-Gabal's wife. He rode roughshod over other elements of traditional religion, marrying a Vestal Virgin (who were legally required to remain unmarried virgins during their service), and moved the most sacred relics of Roman religion (including the fire of Vesta, the Shields of the Salii, and the Palladium) to a new temple dedicated exclusively to El-Gabal. As much as the religiously conservative senators may have disapproved, the lavish annual public festivals held in El-Gabal's honour found favour among the popular masses, partly on account of the festivals involving the wide distribution of food. Nearly half a century after Elagabalus, Aurelian came to power. He was a reformer, strengthening the position of the sun-god as the main divinity of the Roman pantheon; he even built a brand new temple, in Rome, dedicated to the deity. It's also thought likely that he may have been responsible for establishing the festival of the day of the birth of the unconquered sun (Dies Natalis Solis Invicti), which was celebrated on December 25, the day when the sun appears to start rising again - four days after having previously reached its lowest point, though the earliest surviving reference to the festival is in the Chronography of 354. He followed the principle of one god, one empire; his intention was to give to all the peoples of the Empire, civilian or soldiers, easterners or westerners, a single god they could believe in without betraying their own gods. Lactantius argued that Aurelian would have outlawed all the other gods if he had had enough time, but Aurelian only managed to hold on to the position of Emperor for five years. Imperial tolerance only extended to religions that did not resist Roman authority and would respect Roman gods. Religions that were hostile to the state or any that claimed exclusive rights to religious beliefs and practice were not included and some exclusive Eastern cults were persecuted. Jews were given special privileges owing to their dominance in economy, numbers and dispersal, but this tolerance was balanced unevenly on a thin veneer of Jewish submission. Tolerance of Judaism turned to persecution when collaboration was perceived as ending, see Anti-Judaism in the pre-Christian Roman Empire. Intolerant sects could also persecute each other; Jewish sects like the early Christians were denounced by the Jewish establishment as dangerous provocateurs, according to some interpretations of the Council of Jamnia and the Birkat haMinim. The results included massacres of Christian communities and Jewish nationalist groups. The early Christian community was perceived at times to be an intrinsically destabilising influence and threat to the peace of Rome, a religio illicita. The pagans who attributed the misfortunes of Rome and its wider Empire to the rise of Christianity, and who could only see a restoration by a return to the old ways, were faced by the Christian Church that had set itself apart from that faith and was unwilling to dilute what it held to be the religion of the "One True God". The same gods whom the Romans believed had protected and blessed their city and its wider empire during the many centuries they had been worshipped were now demonized by the early Christian Church. 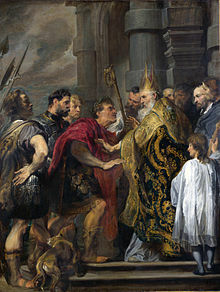 After the initial conflicts between the state and the new emerging religion, Gallienus (ruled 253 to 260) was the first emperor to issue an edict of toleration for all religious creeds including Christianity. According to Christian polemicists writing after his death, Constantine I was baptized on his deathbed, which would make him the first emperor to become a baptized Christian. Eusebius, a contemporary Christian historian, also praises him for having some pagan temples torn down. Nevertheless, whatever the imperial edicts said, the effects of policy under the Christian emperors down to Valentinian I and Valens were enough to cause a widespread trend to Christian conversion, but not enough to make paganism extinct. Actual persecution was sporadic and generally the result of local initiative, for example Martin of Tours' destructions of holy sites in Gaul in the later fourth century. Official orders may have established an understanding that actual persecution would be tolerated, but in the first century of official Christianity did not generally organize it. By the Edict of Milan (313 AD), Constantine continued the policy of toleration, which Galerius had established. His legislation against magic and private divination were driven out of a fear that others might gain power through those means. Nonetheless, this did not mean he or other Roman rulers disfavored divination. Instead, his belief in Roman divination is confirmed by legislation calling for the consultation of augurs after an amphitheatre had been struck by lightning in the year 320. Constantine explicitly allowed public divination as a practice of State ceremony as well as public pagan practices to continue. Constantine also issued laws confirming the rights of flamens, priests and duumvirs. Additionally, he began the practice of using secular power to establish doctrinal orthodoxy within Christianity, an example followed by all later Christian emperors, which led to a circle of Christian violence, and of Christian resistance couched in terms of martyrdom. The actions of Constantius II, who reigned from 337 till 361, marked the beginning of the era of formal persecution against paganism by the Christian Roman Empire, with the emanation of laws and edicts which punished pagan practices. From the 350s, new laws prescribed the death penalty for those who performed or attended pagan sacrifices, and for the worshipping of idols; temples were shut down, and the traditional Altar of Victory was removed from the Senate. There were also frequent episodes of ordinary Christians destroying, pillaging, desecrating, and vandalizing many of the ancient pagan temples, tombs and monuments. The harsh imperial edicts had to face the vast following of paganism among the population, and the passive resistance of governors and magistrates. The anti-pagan legislation, beginning with Constantius, would in time have an unfavourable influence on the Middle Ages and, in some ways, become the basis of the Inquisition. Under the sole rule of Julian from 361–363, Paganism saw an attempt at restoration; while from 363 till 375, under the reigns of Jovian, Valens and Valentinian I, it received a relative tolerance. Julian was a nephew of Constantine and received a Christian training but the murder of his father, brother and two uncles, in the aftermath of Constantine's death, he attributed to Constantius and by association to Christians in general. This antipathy was deepened when Constantius executed Julian's only remaining brother in 354 AD. After childhood Julian was educated by hellenists and was attracted to the teachings of neoplatonists and the old religions. Julian's religious beliefs were syncretic and he was an initiate of at least three mystery religions. But Julian's religious open-mindedness did not extend to Christianity due to its belief that it had an exclusive perspective on religious truth. Seeing itself as the only true religion, Christianity was opposed to, and fundamentally incompatible with, the more inclusive syncretism of paganism. As Emperor, Julian sought to turn the tide in the attempted suppression of non-Christian religions. As his first task he sought to reestablish the old Roman Pagan practice of incorporation of other religions. But now instead of allowing different cults using different names for the same or similar deities, Julian's training in Christianity and Imperial government influenced him to develop a single pagan religion. Thus, his ideas concerning the revival and organization of the old religion, shaping it into a coherent body of doctrine, ritual and liturgy with a hierarchy under the supervision of the emperor was the hallmark of his reign. Julian organized elaborate rituals and attempted to set forth a clarified philosophy of Neo-Platonism that might unite all Pagans. Julian allowed religious freedom and avoided any form of actual compulsion. The Christian Sozomen acknowledges that Julian did not compel Christians to offer sacrifice nor did he allow the people to commit any act of injustice towards the Christians or insult them. However, no Christian was allowed to teach or study the ancient classical authors, "Let them keep to Matthew and Luke", thus ending any chance they had of a professional career. He withdrew the privileges of the Christian clergy, bestowed on them by Constantine, and ordered them to make restitution. Those who had demolished temples during the reign of Constantine and Constantius, were made to rebuild them, or to defray the expenses of their re-erection. Only pagans were allowed to teach in law, rhetoric, philosophy, or practice any form of state sanctioned religious liturgy. Julian required those who had abandoned the deities to purify themselves before they were allowed the privilege of taking part in their worship once again. He was devoted to divination and allowed his subjects to freely practice this art. In general the privileges and immunities given to the Christians were now replaced with those given to pagan philosophers and priests who subscribed to his neo-platonic pagan religion. After the death of Julian, Jovian seems to have instituted a policy of religious toleration which avoided the relative extremes of Constantius and Julian. Under Valentinian I and Valens this period of religious toleration continued. Pagan writers praise both of these emperors for their liberal religious policies. Valentinian and Valens granted complete toleration for all cults at the beginning of their reign in 364. Valentinian, who ruled in the west, even allowed the performance of nocturnal sacrifices, which had been previously prohibited due to the attempt of some people to practice unlawful divination under the cover of the night, after the proconsul of Greece appealed to him. Valentinian also confirmed the rights and privileges of the Pagan priests and confirmed the right of Pagans to be the exclusive caretakers of their temples. Valens, who was ruling in the east, was an Arian and was too engaged with fighting against the Orthodox Christians to bother much with the Pagans. In both the west and east severe laws were once again passed prohibiting private divination. Due to the over zealousness of the populace to stop harmful divination, the haruspices and augurs began to be afraid to show themselves in public. This led the emperors to formally authorize the practice of official and lawful divination by law in 371. Despite the official policy, anti-pagan laws remained in force, and unofficial destruction of pagan holy sites was also tolerated. Upon the death of his father (Valentinian I) in the year 375, Gratian began his actual reign at the age of sixteen. Six days after the death of Valentinian I, Gratian's half brother, Valentinian II, who was only four years old, was also declared emperor. After the death of Valens, at the battle of Adrianople in 378, Gratian chose a Spaniard named Theodosius I to succeed his uncle. Gratian had been educated by Ausonius who had praised his pupil for his tolerance. Upon the death of his father, Gratian came under the influence of Ambrose, who became his chief advisor. Under the influence of Ambrose, active steps to repress Paganism were taken. The influence of Ambrose was a significant force that brought to an end a period of widespread, if unofficial, religious tolerance that had existed since the time of Julian. Gratian dealt Paganism several blows in 382. In this year, Gratian appropriated the income of the Pagan priests and Vestal Virgins, confiscated the personal possessions of the priestly colleges and ordered the removal of the Altar of Victory. The colleges of Pagan priests also lost all their privileges and immunities. Gratian declared that all of the Pagan temples and shrines were to be confiscated by the government and that their revenues were to be joined to the property of the royal treasury. Pagan Senators responded by sending an appeal to Gratian, reminding him that he was still the Pontifex Maximus and that it was his duty to see that the Pagan rites were properly performed. They appealed to Gratian to restore the altar of Victory and the rights and privileges of the Vestal Virgins and priestly colleges. Gratian, at the urging of Ambrose, did not grant an audience to the Pagan Senators. In response to being reminded by the Pagans that he was still the head of the ancestral religion, Gratian renounced the title and office of Pontifex Maximus under the influence of Ambrose, declaring that it was unsuitable for a Christian to hold this office. The Christian persecution of paganism under Theodosius I began in 381, after the first couple of years his reign in the Eastern Roman Empire. In the 380s, Theodosius I reiterated Constantius' ban on Pagan sacrifice, prohibited haruspicy on pain of death, pioneered the criminalization of Magistrates who did not enforce anti-Pagan laws, broke up some pagan associations and destroyed Pagan temples. Between 389-391 he emanated the "Theodosian decrees," which established a practical ban on paganism; visits to the temples were forbidden, remaining Pagan holidays abolished, the eternal fire in the Temple of Vesta in the Roman Forum extinguished, the Vestal Virgins disbanded, auspices and witchcrafting punished. Theodosius refused to restore the Altar of Victory in the Senate House, as asked by Pagan Senators. In 392 he became emperor of the whole empire (the last one to do so). From this moment till the end of his reign in 395, while Pagans remained outspoken in their demands for toleration, he authorized or participated in the destruction of many temples, holy sites, images and objects of piety throughout the empire, and participated in actions by Christians against major Pagan sites. He issued a comprehensive law that prohibited any Pagan ritual even within the privacy of one's home, and was particularly oppressive of Manicheans. Paganism was now proscribed, a "religio illicita". He is likely to have suppressed the Ancient Olympic Games, whose last record of celebration is from 393. Upon the death of Theodosius I in 395, a political crisis ensued, which the barbarians were quick to take advantage of by invading the empire on an unprecedented scale. Since most of the Germanic tribes infiltrating, settling, or invading the Empire were Arian Christian, many nominal Orthodox Christians became less certain of their religion. Some, in a sense of superstition or ancient Roman pagan patriotism, felt the invasions were the result of abandoning the old ways. Others believed the success of the Germans was because the Orthodox Church was corrupt. Pagans, in their turn, became more aggressive and began to blame the Christians for the disasters affecting the empire. Despite the pleas of many pagans for tolerance, Honorius and Arcadius continued the work of their father by enacting even more anti-Pagan laws in an attempt to stop this revival of Paganism. The fact that they had to keep repeating their threats by the enactment of numerous laws against the practice of Paganism indicates that their efforts did not succeed in stamping out the traditional Pagan rites, which continued to be practiced discreetly. During the early part of the reign of Honorius, Stilicho was able to exercise unlimited power over the west. Stilicho exercised moderation in his religious policies and enacted laws that were favorable to the Pagans. Consequently, during the time in which Stilicho held power, the Pagans enjoyed a brief respite from persecution. In 395, Arcadius declared that the solemn days of the pagans were no longer to be included in the number of holidays. In the same year, another law was passed by Arcadius that prohibited anyone from going to a pagan sanctuary or temple or celebrating any kind of pagan sacrifice. This law seems to have been targeted at those Christians who were converting back to paganism as it specifically mentions "those who are trying to stray from the dogma of the catholic faith." In 396, the privileges of pagan priests and other clerics were officially revoked. In the same year, Arcadius ordered that pagan temples standing in the countryside were to be destroyed without disorder or riot. This law seems to indicate that the number of pagans in the countryside was still too large for the Christians to openly destroy the temples that were located there. As a result, Christians had to be content with destroying the pagan temples that were located in mostly municipal areas where they could easily outnumber the pagan inhabitants. The large number of pagans in the east also seems to have forced Arcadius into allowing the ancient festivals and public games to continue. Meanwhile, three laws were enacted in the west in 399, under the influence of Stilicho, which were relatively favorable to pagans. Due to the riots caused by Christians in their attempts to destroy the temples, the first of these laws protected pagan temples from the destruction of Christians who pretended that they had been authorized by the government to destroy them. The second of these laws acknowledged the right of the people to continue to participate in the traditional banquets, shows, gatherings and amusements associated with the old pagan religion; it did, however, forbid the public performance of any pagan rites or sacrifice. The third law forbade the destruction of pagan temples that had been cleared of forbidden things and ordered that they were to be kept in good repair. After the death of Stilicho, Honorius and his party in the state gained control and harsh laws against paganism were once again enacted. In 408, Honorius enacted a new law which ordered that all statues and altars in the temples were to be removed and that the temple buildings and their income were to be appropriated by the government. This law also forbade the holding of any pagan banquet or celebration in the vicinity of the temples. The execution of this law was placed in the hands of the bishops. Two other laws decreed that buildings belonging to known pagans and heretics were to be appropriated by the churches. Arcadius died in 408 and his eight-year-old son, Theodosius, was thereupon proclaimed emperor in the East. In the same year, Honorius enacted a law that prohibited anyone who was not catholic from performing imperial service within the palace. Zosimus reports that Honorius was forced to repeal this law after one of his best officers, who happened to be a pagan, resigned in protest. At the beginning of 409, Honorius enacted a law that punished judges and officials who did not enforce the laws against pagans. This law even punished men of rank who simply kept silent over any pagan rite performed in their own city or district. The hopes of pagans were revived with the elevation of Priscus Attalus, at Rome, in 409. Alaric, an Arian Christian, soon tired of his puppet, however, and Attalus was deposed in the summer of 410 when Honorius promised to negotiate a peace treaty. When these negotiations failed, Alaric took and sacked the city of Rome. This catastrophe shocked the entire Roman world. Both Christians and pagans quickly began to blame each other for something that had hitherto been thought impossible. In this heated atmosphere, Honorius once again reiterated his anti-pagan legislation. There are numerous fragments extant of several Pagan historical works, such as the works of Eunapius and Olympiodorus, which indicate that pagans were now openly voicing their resentment in writing. Even after the sack of Rome, in 410, pagans believed that the recent decline of Rome had been caused by the neglect of the ancestral traditions. In 415, Honorius enacted yet another law that appropriated the Pagan temples throughout the Roman Empire to the government and ordered that all objects that had been consecrated for Pagan sacrifices were to be removed from public places. A prominent example of the anti-pagan climate at the time is the case of the philosopher Hypatia of Alexandria, killed by a mob in 415. In 416, Honorius and Theodosius II ordered that pagans would no longer be admitted to imperial service nor would they be allowed to receive the rank of administrator or judge. In 423, Theodosius II reiterated the previous laws against Pagans and declared that all Pagans who were caught performing the ancient rites would now have all their goods confiscated and be exiled. In August 423, Honorius died and power was seized in the west by John, who had held the office of Primicerius Notariorum. John appears to have ushered in a period of religious toleration. John seems to have attempted to curb the power of ecclesiastics and the privileges of the church in an attempt to treat all people equally. In 423, Theodosius II published a law that demanded that Christians (whether they were really such or pretended to be so) were not to disturb Pagans who were living peaceably and doing nothing contrary to the law. In 425, Theodosius II sent an expedition to the west to depose John and establish Valentinian III as emperor of the west. After John was captured and executed, Valentinian III was proclaimed emperor in the city of Rome. While in the west, Theodosius II enacted two anti-pagan laws in 425. The first of these stipulated that all pagan superstition was to be rooted out. The second law barred pagans from pleading a case in court and also disqualified them from serving as soldiers. Theodosius then left Valentinian to rule the west and returned to Constantinople. The continued vitality of paganism led Marcian, who became emperor of the east in 450 upon the death of Theodosius II, to repeat earlier prohibitions against pagan rites. Marcian decreed, in the year 451, that those who continued to perform the pagan rites would suffer the confiscation of their property and be condemned to death. Marcian also prohibited any attempt to re-open the temples and ordered that they were to remain closed. In addition to this, in order to encourage strict enforcement of the law a fine of fifty pounds of gold was imposed on any judge or governor, as well as the officials under him, who did not enforce this law. However, not even this had the desired effect, as we find Leo I, who succeeded Marcian in 457, publishing a new law in 472 which imposed severe penalties for the owner of any property who was aware that Pagan rites were performed on his property. If the property owner was of high rank he was punished by the loss of his rank or office and by the confiscation of his property. If the property owner was of lower status he would be physically tortured and then condemned to labor in the mines for the rest of his life. In the year 457, Leo I became the first emperor to be crowned by the Patriarch of Constantinople. Anthemius (467-472), one of the last Western Roman emperors, seems to have planned a pagan revival at Rome. He was a descendant of Procopius, the relative of Julian. Anthemius gave Messius Phoebus Severus, a pagan philosopher who was a close friend of his, the important offices of Praefectus urbi of Rome, Consul and Patrician. Anthemius placed the image of Hercules, in the act of vanquishing the Nemean lion, on his coins. The murder of Anthemius (by Ricimer) destroyed the hopes of those pagans who believed that the traditional rites would now be restored. Shortly thereafter, in 476, the western emperor was deposed by Odoacer, who became the first barbarian king of Italy. In spite of this disaster, pagans made one last attempt to revive the pagan rites. In 484, the Magister militum per Orientem, Illus, revolted against Zeno and raised his own candidate, Leontius, to the throne. Leontius hoped to reopen the temples and restore the ancient ceremonies and because of this many pagans joined in his revolt against Zeno. Illus and Leontius were compelled, however, to flee to a remote Isaurian fortress, where Zeno besieged them for four years. Zeno finally captured them in 488 and promptly had them executed. As a result of the revolt, Zeno instituted a harsh persecution of pagan intellectuals. With the failure of the revolt of Leontius, some pagans became disillusioned and many became Christian, or simply pretended to, in order to avoid persecution. The Christianization of the Roman Empire became complete when the emperor Anastasius I Dicorus, who came to the throne in 491, was forced to sign a written declaration of orthodoxy before his coronation. 313 By the Edict of Milan, Constantine and Licinius establish toleration of Christianity. 329–335 Constantine orders destruction of Hellenic temples at Didyma, Mt. Athos, Aigeai, Baalbek etc. According to pagan rhetor Libanius (Address to Theodosius, Pro Templis, 6 and 37), Constantine I "did not bring any change to the traditional [=pagan] worship... one could notice that [during the reign of Constantine] all rituals were performed properly" and "he [Constantine] did not prohibit [pagan] sacrifices". According to Zosimus (book 2 of his "History"), Constantine erected two pagan temples in his capital, Constantinople. 361–363 Emperor Julian, the last pagan Emperor, proclaims restoration of Hellenic worship. 389–391 Theodosian decrees, Christianity becomes official state religion of the Roman Empire. 440-450 All Hellenic monuments, altars and Temples of Athens, Olympia, and other Greek cities are destroyed. As German historian Gregorovius, in his "History of Athens" says, the pagan monuments of Athens and Greece were the best preserved among other monuments in the late Roman Empire. 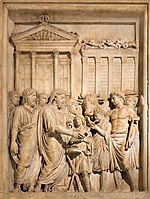 410-529 Despite the Platonic Academy being destroyed in the first century BC by Sulla, it was not until the early 5th century (c. 410) that a revived academy (which had no connection with the original Academy) was established by some leading Neoplatonists. In 529 the emperor Justinian ended the funding of the revived Neoplatonic Academy because of active paganism of its professors. Other schools continued in Constantinople, Antioch and Alexandria which were the centers of Justinian's empire. Modern historians such as Blumental and A. Cameron claim that the Neoplatonic Academy continued to exist for almost 50–60 years after 529. 651 Harran conquered by the Arabs. Sabians, descendants of Hellenistic tradition by virtue of their Hermetism are judged a people of a book, the Hermetic Corpus and as such are permitted to survive. The Nabatean Agriculture was said by Maimonides to have been an accurate record of the beliefs of the Sabians in the Harranian area. 804 Hellenes of Laconia, Greece, resist the attempt of Tarasius, Patriarch of Constantinople, to convert them to Christianity. ^ a b c d e f g h i "A History of the Church", Philip Hughes, Sheed & Ward, rev ed 1949, vol I chapter 6. ^ a b "Julian the Apostate and His Plan to Rebuild the Jerusalem Temple", Jeffrey Brodd, Biblical Archaeology Society, Bible Review, Oct 1995. ^ The Edict of Milan, complete text in English (Constantine, 313 AD) Archived 17 July 2007 at the Wayback Machine. Gbgm-umc.org. Retrieved on 2013-07-28. ^ Zosimus 2.29.1-2.29.4, Theodosian Code 16.10.1. Laws against the private practice of divination by Roman citizens had been enacted ever since the time of the emperor Tiberius. It was his fear that Roman citizens would fall outside of the official public Roman religion, accept foreign cults in their private family practices, and in turn corrupt the general Roman state. ^ Sheridan, J.J. (1966) The Altar of Victor – Paganism's Last Battle. in L'Antiquite Classique 35 : 186-187. ^ Sozomen Ecclesiastical History 3.18. ^ Ammianus Marcellinus Res Gestae 9.10, 19.12. quote summary: Ammianus describes pagan sacrifices and worship taking place openly in Alexandria and Rome. The Roman Calendar of 354 cites many pagan festivals as though they were still being openly observed. See also the descriptions of pagan worship in the following works: Firmicius Maternus De Errore Profanorum Religionum; Vetus Orbis Descriptio Graeci Scriptoris sub Constantio. ^ C. G. Herbermann & Georg Grupp, "Constantine the Great", Catholic Encyclopedia, 1911, New Advent web site. ^ a b "FLAVIUS CLAUDIUS JULIANUS", Karl Hoeber, Catholic Encyclopedia 1910, retrieved 13 May 2007. ^ Sheridan, J.J., "The Altar of Victor – Paganism's Last Battle." L'Antiquite Classique 35 (1966): 187. ^ Hughes, Philip Studies in Comparative Religion, The Conversion of the Roman Empire, Vol 3, CTS. ^ Eunapius reflects some of the Pagan attitudes of this period in his writings. His attitude, however, represents the most fanatical element of the Pagan reaction. ^ Encyclopædia Britannica, Higher Education in the Byzantine Empire, 2008, O.Ed. Athanassiadi, P. "Persecution and Response in Late Paganism: the Evidence of Damascius", Journal of Hellenic Studies 113 (1993): 1-29. Harl, K. W. "Sacrifice and Pagan Belief in Fifth- and Sixth-Century Byzantium", Past and Present 128 (1990): 7-27. MacMullen, Ramsay. Christianizing the Roman Empire: AD 100-400. Yale University Press, 1984. Trombley, Frank R. Hellenic Religion and Christianization, c. 370-529. 2 vols. Leiden: Brill, 1993–4; reprint 2014.